Over the past few months, Athens-Banner Editorial Editor (and dedicated bike commuter) Jim Thompson has written frequently about alternative transportation. Always eager to talk about transportation choices, we joined the debate in print and in our newsletter. We’ll collect and re-print our responses here. Jim’s original articles, of course, can be found here. Before we begin, thanks again to Jim Thompson of the Athens Banner Herald for continuing the conversation about transportation infrastructure in Athens. Mobility and transportation choices are major issues that deserve vigorous public debate. Recently, Jim asked if there are enough bike commuters in town to convince the Mayor and Commission to prioritize connectivity of the current bike network. 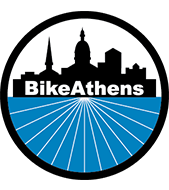 When examined closely, we can separate Jim’s question into two parts: 1) does Athens have the demand to support more bike lanes and 2) regardless of demand, should the Mayor and Commission place a greater emphasis on improving and expanding local bike infrastructure? BikeAthens does not often address these questions because in our work as advocates we take the answers as given (emphatically yes to both). However, many people probably share Jim’s concerns, so it is important to respond to his call to action. 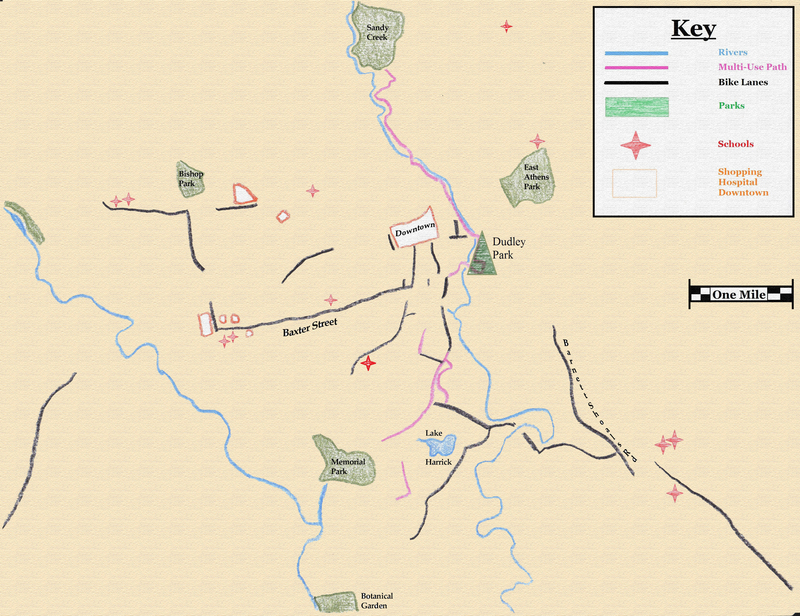 Due to the length of our response, we’ll publish our answer to Question 1 this week and Question 2 next week. 1) Integrating bike infrastructure into the transportation network already is Athens Clarke-County policy and a planning / engineering best-practice. Additionally, Athens has more than enough demand to support a connected bike network. In his Monday editorial (8/4/14), Jim Thompson wondered if there are enough bike commuters in Athens to support more bike infrastructure. In some ways, the question is moot. Way back in 2001, the Athens-Clarke County Bike Master Plan acknowledged the community’s desire for a network of identified bike routes and began to schedule infrastructure improvements. We see the fruits of this plan in the soon-to-be completed College Station bike lanes that will extend across the river. In 2012, the ACC Complete Streets Policy, while far from perfect, also reaffirmed the County’s commitment to transportation choices (see the planned addition of 5 foot shoulders as part of the Whitehall Rd Hill reduction project). Through these documents, the Mayor and Commission have long indicated that they recognize the need for more transportation choices, and these polices codify ACC’s support for a connected network of bike lanes. Furthermore, current planning / engineering guidelines establish bike lanes as an integral part of a complete transportation network. The 2012 update of the American Association of State Highway Transportation Officials design guides—used as a primary resource in Clarke County—designate bike lanes as the backbone of a bike network. In this way, both ACC policy and current design guides already support, in Jim’s words, a “serious effort at installing or improving a range of transportation infrastructure.” Enhanced bike infrastructure is thoroughly melded with ACC goals and objectives, and bike plans and designs have become standards in ACC engineering guidelines. Still, the demand exists to encourage the Mayor and Commission to speed up the implementation of the Bike Master Plan and connect the existing bike lanes. First a quick note: the county does not count bikes during its regular traffic counts. In recent years, new technologies have enabled cities to precisely (and cheaply) count the number of people riding on the roads, but Athens has not yet adopted these methods. As a result, unfortunately, Athens-Clarke County cannot accurately track the growth of bike commuting. Nonetheless, there are telling clues that indicate that current ridership levels more than justify increased bike infrastructure. Collected survey data indicates Athens has more bike commuters than almost every similarly sized city in the Southeast. According to the 2014 American Community Survey Report, of medium sized cities Athens has the 15th highest rate of bike commuting in the country. More locally, ACC’s Prince Avenue Corridor Report noted tracts surrounding Prince Avenue bike to work at rates above those found in Minneapolis, one of the most bike friendly cities in America. These rates are well above the national average. They are higher than cities that are renowned for their integrated bike infrastructure. If you are concerned about riding outside of a bike lane, it becomes difficult to plan a route across Athens. Only 3 short sections of bike lane reach downtown (which is full of hazardous diagonal parking); only Dudley Park is accessible by a multi-use path and the Greenway is only connected to other bike infrastructure at the intersection of Williams / Oconee (and it’s only easily accessible in one direction). None of Athens wonderful restaurants along Prince Ave, Milledge, or in Five-Points are served by bike lanes, and none of the stores on Broad or Atlanta Highway are accessible by bike lane or multi-use path. Despite the lack of connectivity, bicycle culture and bicycle commuting is thriving in Athens. Athens-Clarke County policy has recognized and embraced increased bicycle infrastructure. Engineering guidelines call for a network of bike lanes. Athenians ride more than just about and city in the Southeast. The need is there. The demand is there. It is time to put bike lanes there (and there and there). If 60%–or even 50% or 40%–of people are Interested and Concerned about commuting, expanding the reach of bike lanes will result in an immediate increase in biking. The more destinations easily and conveniently connected to bike infrastructure gives people the choice of how to navigate Athens. Next week, in Part 2, we will discuss the numerous and sizeable economic and health benefits of increased cycling, and how increased transportation choices will help Athens-Clarke County meet its budgetary Goals and Objectives.